The finished size of Honey is 25cm long. Meet Honey the Bee! Knitted in Deramores Studio DK, Honey is an ideal gift for your little ones or just an a home accessory. 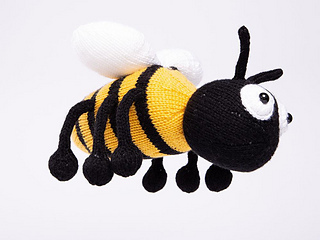 To create this cute, buzzy friend you will require toy stuffing, a darning or tapestry needle to sew the knitted pieces together and two 12mm domed black buttons for eyes. Note: The yarn and pattern can be purchased as a kit from Deramores at the link below, or the digital pattern on its own is free to download from Deramores (the pattern is not available to download on Ravelry).